Twin Spin, a unique Net Entertainment (NetEnt) slot based on the classic slot theme, features 243 ways to win, a top fixed jackpot of 1000 coins, twin reels, and stacked symbols. Twin Spin has 243 ways to win; so players do not have to manually select paylines. Players can bet up to 10 coins, the bet amount increasing by $0.25 for each level. This means that players can bet as little as $0.25 to as high as $125.00 per spin of the reels. If players want to bet maximum, they only have to select the Bet Max option. The game also comes with an Autoplay option, which allows players to set the game to play on its own while they get busy with something else. Once players have placed their bets, they have to hit the Spin option to set the reels spinning. If a winning combination of symbols is displayed on the reels at the end of one spin of the reels, players will get paid according to the game’s payout structure. The slot also comes with a Skill Stop feature, which transforms it into a skill-based game. This feature allows players to stop the reels in mid-spin to capture a winning combination. Based on the classic slot theme, Twin Spin is a simple slot that is packed with sophisticated features such as 243 ways to win, stacked symbols, and twin reels. Since it lacks complex bonus features such as free games with multipliers, bonus games that open on the second reel, and so on, it is the ideal game for beginners. Although the slot reminds players of the slots of the past, its graphics are brilliant and sound effects are realistic. The reels feature icons of high-value cards, sevens, bars, bells, and cherries. 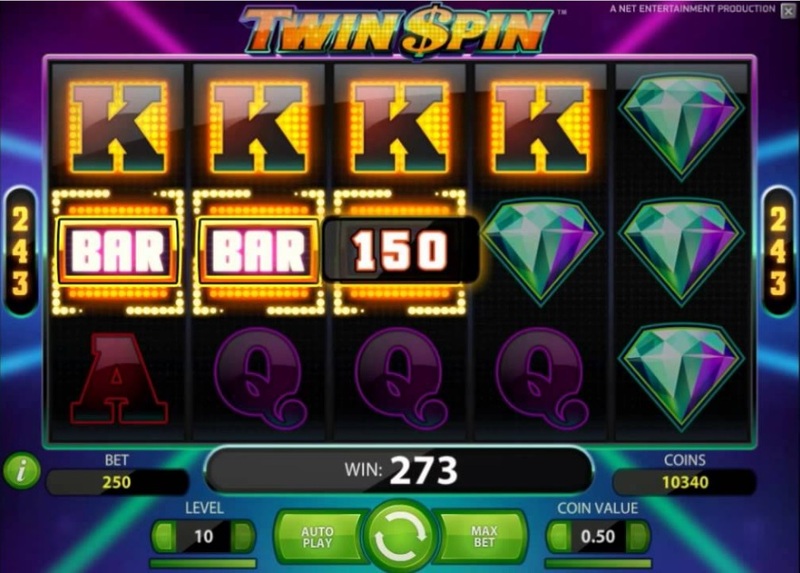 The most unique feature of Twin Spin slot is its Twin Reel Feature. Each spin begins with twin reels, which are located next to each other and are identical. As the reels are spinning, the twin reels can become three, four, or even five reels. This feature increases players’ chances of winning big money. The symbols across the reels of Twin Spin can appear in stacks of up to three symbols each. Stacked symbols help players to complete winning combinations and grab extra payouts. Twin Spin also has a wild symbol, which is the symbol labeled WILD. This symbol appears only on the second, third, fourth, and fifth reels, but helps players complete winning combinations. The wild symbol can substitute for all the other symbols across the reels. Initially, players may feel that the top fixed payouts are on the low side. However, players can win up to 270,000 coins while playing this slot, which is available for fun or real money at NetEnt casinos.